I’m taking a few moments to sit and be still in my living room. It definitely feels like a stolen moment. I’ve just finished vaccuuming a few minutes ago and as I wrapped up the power cord, I heard a call from upstairs to “stay downstairs”. Luckily, neither of my guys are overly devious, so I have no cause for concern. They simply want to keep playing whatever game they’ve created without parental involvement. All I can hear is the sound of running up and down the hallway and various battle sounds. They play so nicely together now. 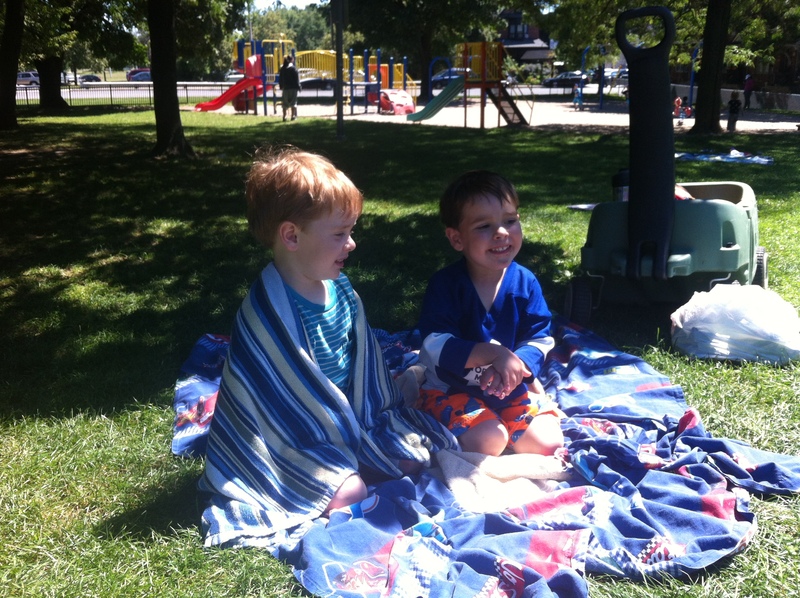 Something fantastic happened over the summer – they each discovered that they actually enjoy playing together; they’ve become friends. It’s what I hoped for from the moment I found out I was pregnant with Nathan. 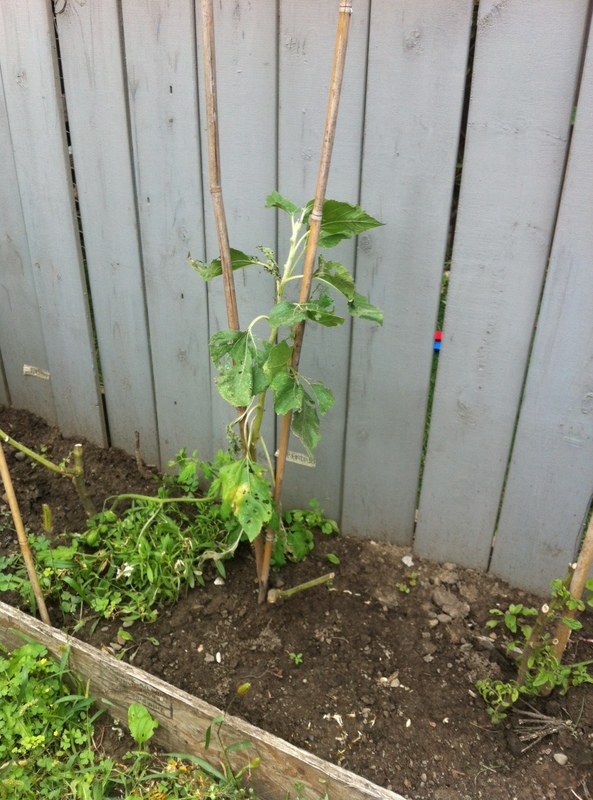 I really hope it sticks with them as they grow together. Listening to them play and giggle together is one of the greatest sounds in the world. Now I’ve gotta go: I’ve been told it’s craft time. For the past 20 years, the end of summer has brought sadness, not only for the loss of beautiful sunny days, long nights and outdoor parties around the BBQ. It also marks the anniversary of when I lost my father. The date usually sneaks up on me, and when it does it brings me back to the last few days of August 1993. Yesterday I saw the date on my phone and the numbers innocently displayed on the screen punched me in the gut. Just like they do every year. Now that my days are filled with the needs of two little people, I don’t have the time to look at the calendar, and I think it’s a good thing. This morning while I drank my coffee outside for a few minutes of peace, I remembered again and I had a few moments to let the tears come to my eyes, but then I remembered that while I’ll always feel like a lost 18-year-old when I think of the moment that I lost my dad- I am transported back with every detail and emotion – there are other current issues that I need to be present for. A perfect example: Nathan just needed me to help put “his” chair back at his place at the table. He’d put a sticker at the back of it months ago to know which one was his. Somehow it had been moved to another spot at the table. Also, he needed a box of raisins. 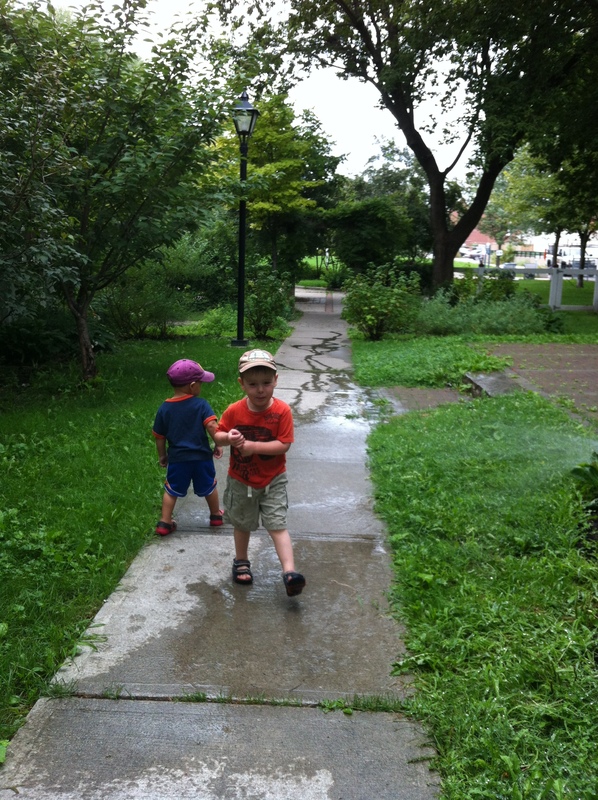 I had much more that I had in mind to write – some other fun stuff about what we did this summer, and the fact that Brendan is starting SK in French Immersion on Tuesday, and that Nathan is going to start going to nursery school a few days a week, but I have more pressing business. Brendan needs me to play knights with him (and possibly also pirates). I must go. Please forgive me for the grumbles, but I’m bloody sick of winter. This year we’ve had much more snow than we’ve had in years, and it still hasn’t been that much. Generally speaking, I don’t mind snow. 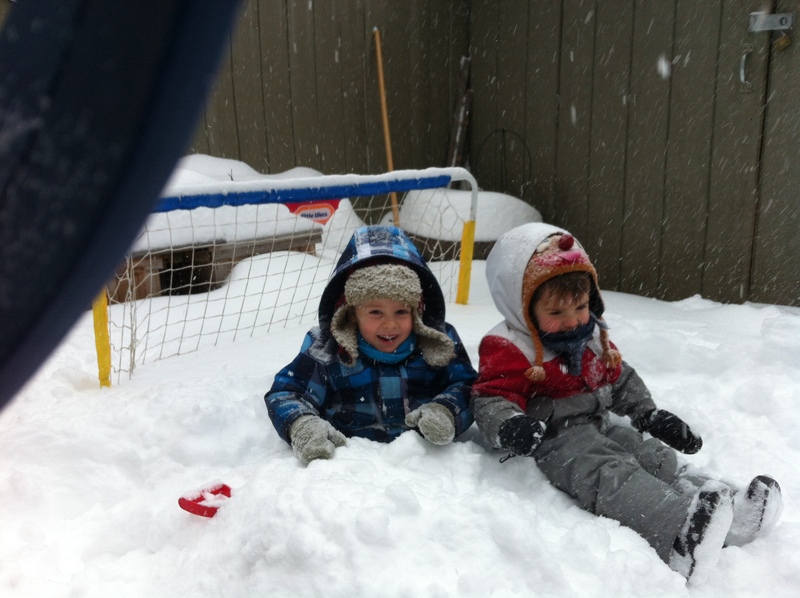 The boys loved the snow, which is great…Even if it was cold, if there was snow to play in they loved being outside. We had so much fun building forts or even just shovelling. What makes it less fun is when the weather fluctuates so dramatically as it has this year: snow would fall, then it would get warmish, so the snow would start to melt, then the next day it would get freezing (-15C or more) so all that melted snow then freezes into ice. Hard, slippery ice. Everywhere. Brendan started school in September. He’s in JK, and spends a total of two hours and forty minutes at school every day. It’s such a long stretch, that sometimes I even have time to go to the grocery store with Nathan before I have to turn around and pick him up again. Many mornings after drop-off, I end up hanging out at the school with Nathan while we kick, throw or bounce the ball that he’s decided to bring along that day. Just in case he forgets to bring one with him, we have a stash of about 15 balls in the back of the car. For some reason he likes to bring a ball to the car when we drive anywhere and toss it in the back. I’ve never fully understood that fascination, but it does make sure that we have a ball for all sports where ever we go. Yesterday and today, however, Nathan was robbed of his morning run around the playground. We went to the school, brought Brendan to his classroom, helped him take off his rain boots and coat and then discovered that he really didn’t feel well enough to be there. Not in the least. He had a headache, and felt a bit warm. So right after O Canada, I helped him get re-bundled and headed back home with both boys in tow. The past two days were his first sick days, so I wasn’t quite prepared for how to properly entertain Nathan (who feels just fine, thank you very much) while looking after his big brother. Can you guess which one is sick? On Brendan’s part, there was a lot of tv watching. On Nathan’s, a lot of throwing balls “up high in the sky” (or, more accurately, at the wall). I did come up with a few genius activities. I had a package of egg-free gingerbread cookies ready for decorating. The end result reminded me why I try to avoid giving Nathan too much sugar. The boy was practically bouncing off the walls. I’m fairly positive that he ate a handful of the red sugar. Good times. 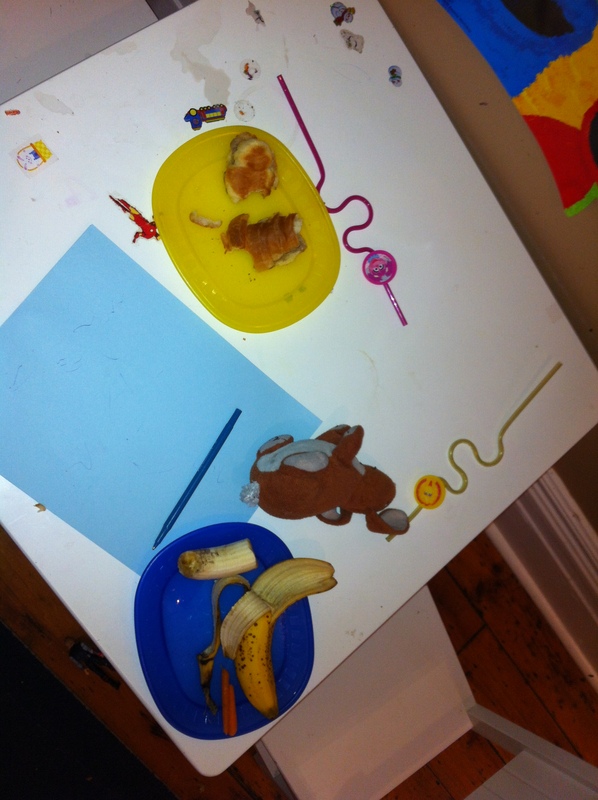 They both even ate some of the cookies, even though they taste marginally better than cardboard. I guess the icing masked the flavour of the cookie. At this point I think he’s just eating the candy off the cookie, but knows to avoid the cookie itself. Not known for his refined tastes, if I would have let him, he would have eaten every.last.crumb. Today, after much tv watching, we completed the finishing touches of the Christmas tree (they took care of the bottom half of the tree), and made some ornaments. At first, they showed zero interest in putting anything on the tree, and then out of the blue started working their way through the box of unbreakable ornaments. Nathan spent more time leaving mini bells around the house than on the tree, but the result is pretty nice I think. Tomorrow, Brendan will definitely be going to school. I think that whatever has been ailing him has passed – he spent half an hour running sprints upstairs before bedtime. He’ll be devastated when I break the news to him in the morning. No matter how much he loves his teacher (and he adores her), he still puts up a decent fight most mornings. Hopefully that won’t continue forever. I’ve been silent for a while. Life, as always, has been busy, but there’s more to it than that. I started doing freelance editing about two days after I quit my full-time job, and for the past few months many of my nights and weekends have been spent in front of the laptop. 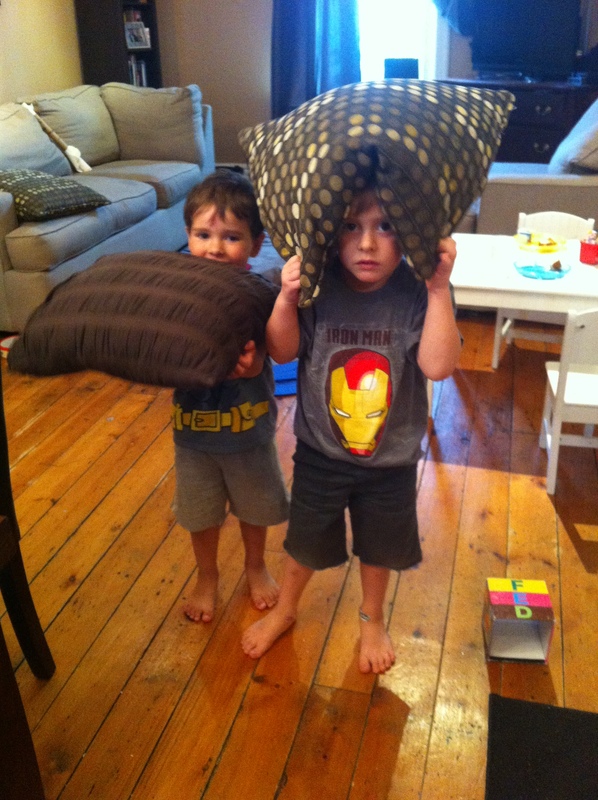 Some nights I would work a full 7 hours after tucking the boys into bed. I couldn’t even think about writing anything interesting, and the last thing that I wanted was to spend any more time in front of my laptop. I’m at the end of a long stretch, though. The final book that I’m editing in 2012 will be completed by the end of the week, and I’ve decided that I’m going to take a much lighter workload from now on. I need time to think, time to play with the boys, and time to just relax. I haven’t had enough of that lately. Yes, they are in the trunk section of the car. No, I wasn’t driving so they remained safe the whole time. 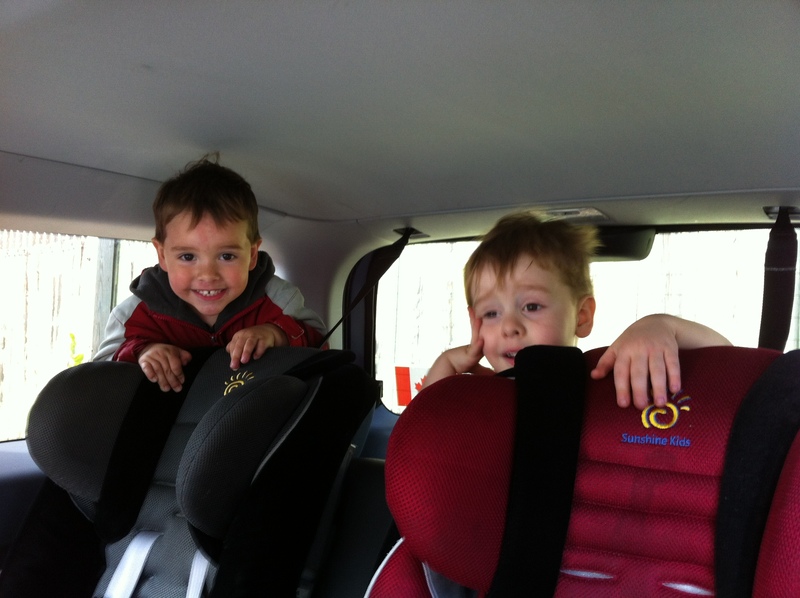 Although they begged me to let them sit back there for the drive home. And beyond my work, there has been a lot going on. 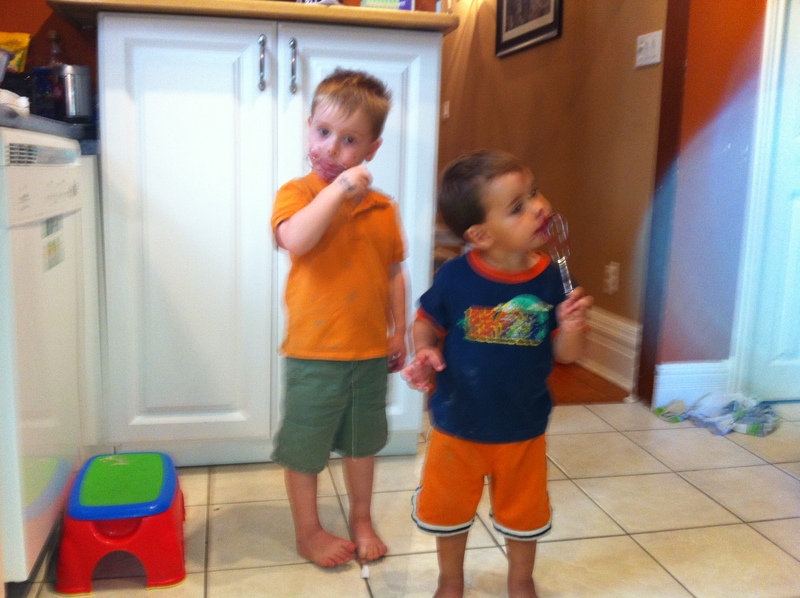 Brendan started school, we had part of our house reno’d, Brendan turned 4 (OMG! ), and I have rediscovered my love of cooking delicious meals. I will get back to writing about the wonderfulness of my children, I promise. And I will share photos of our brand new office and anything else that seems remotely interesting to me, but which might bore the average person to tears. I will oblige and share a photo, but for today, those worthy subjects will have to wait. Right now I feel like writing about something that has been tugging at my heart since I heard the news.Today I discovered that an old friend died after a long battle with cancer. In the wonderful and weird world of Facebook, I found out by seeing a post on my “newsfeed”, that came directly from her wall. I haven’t spoken to Tina in about 10 years, but we kept in touch via the occasional facebook message, and I sent her words of encouragement as she navigated through her cancer treatments.